Each year the Arizona Desert Bighorn Sheep Society builds or redevelops five or six water holes under the direction of the state and federal agencies responsible for the management of desert bighorn sheep habitat. The projects are usually scheduled January through May and require one weekend to complete. On Saturday, April 27th, ADBSS will participate in an Eagle Scout project – a muck out of a tank north of Redfield Canyon. This is a SATURDAY project only. Access to the project site will be available after lunch on Friday. From San Manuel, take Hwy 74 (South Veterans Memorial Blvd) south. The road makes a hard left and turns into Redington Road. Stay Right as it gets close to the San Pedro River, go south about 19 miles. After you go over the first concrete bridge, approximately ¾ miles, the gate will be on the left (east side) of road. The gate will be unlocked. See map. This schedule is tentative. Some projects may be replaced with others; however, the dates for the projects are firm. When details become available for a given project, you will be able to view them by clicking on the project name below. Over the past several years, Arizona Department of Transportation has worked to transform the highly traveled US 93 between Wickenburg to the Hoover Dam from a two-lane highway to an environmentally friendly four-lane, divided highway. In an effort to protect the native bighorn sheep population and provide added safety to drivers, ADOT, Federal Highway Administration, and Arizona Desert Bighorn Sheep Society provided Arizona Game and Fish Department funding to identify locations where bighorn cross the highway to identify the best possible locations for overpasses that would enable bighorn to safely cross the highway. To alleviate bighorn-vehicle collision component, and improve habitat connectivity issues, three wildlife overpasses 100-feet wide and 203-feet long and adjacent funnel fencing were constructed to allow wildlife to cross the road safely and exclude desert bighorn from the roadway reducing risk for motorists. The project has been successful. Cameras installed on the crossing bridges have captured the desert bighorn sheep using the new overpasses (see video links below). To read more about this project, click HERE. On November 16th and 17th Region VI conducted it s first net gun capture of bighorn sheep in Unit 22 and 24B. Fifteen bighorns from each unit were captured to supplement the lingering bighorn sheep herd in the Mineral Mountains that was established in 2003. There were also two ewes that were captured in the Superstation Wilderness area of Unit 24B that exhibited signs of Contagious Ecthyma; these ewes were ear tagged and released on site. 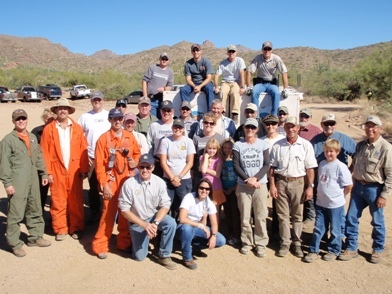 Many individuals and groups were involved in this successful capture and release operation including: Region IV, Game Branch, Research Branch , Tonto National Forest, Bureau of Land Management, Phoenix Zoo, Papillon Helicopters, and the Arizona Desert Bighorn Sheep Society. This morning, November 18th, at around 8:00 a.m. the Arizona Game and Fish Department released 10 bighorn sheep into the Mineral Mountains, near the entrance to Box Canyon. This is the second release of bighorns into Game Management Unit 37B. This group of sheep were captured in the Trigos, south of Quartzite, along the Colorado River. Two young rams and 7 ewes were released. ADBSS members and the BLM were present for the release. 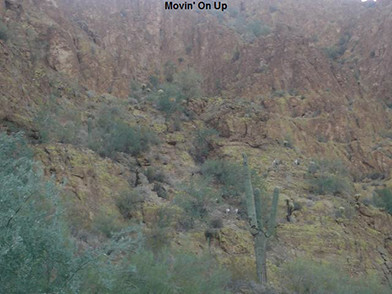 This was the 101st translocation for the Arizona Game and Fish Department, during their 50th year of translocating sheep in the state of Arizona. The Arizona Desert Bighorn Sheep Society has provided the funding for this work through efforts that include our annual fundraisers, auctions and raffles of bighorn sheep tags. 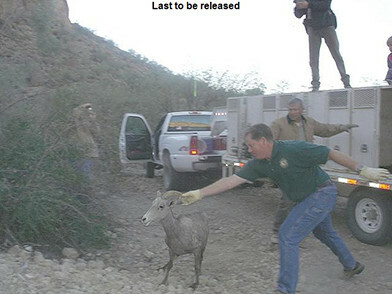 On Saturday November 17, 2007 the Arizona Game and Fish Department accomplished its 100th transplant of bighorn sheep by conducting a release in the Bighorn Mtns of GMU 42. 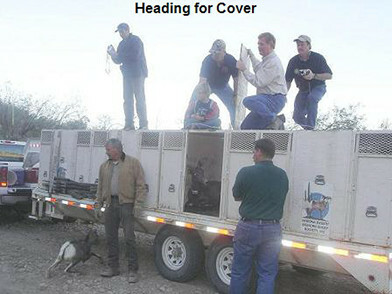 Twelve desert bighorn sheep (10 ewes and 2 small rams) were captured near Fisher Pt. in the Imperial Hills of GMU 43B and released at the southern end of the Bighorn Mtns to join the sheep that were released last year. This notable event also coincided with the 50th anniversary of bighorn sheep translocations in Arizona. The release was well attended and documented. An excellent article memorializing these milestones will be in an upcoming issue of "Arizona Wildlife Views". It is also important to note that this year four translocations of bighorn sheep will be accomplished. Earlier in November, 27 sheep were captured in the Virgin Mountains of GMU 13B and released into the Hells Half Acre area (Burro Creek) of Game Management Unit 18B. Another 22 sheep were captured in the Imperial Hills and Trigo Mountains of Game Management Unit 43B and released into the Bighorn and Mineral Mountains. And later in November a capture of Rocky Mt. Bighorn Sheep will be conducted at the Morenci Mine in GMU 27 and released into Clear Creek of Game Management Unit 6B to join the 60 +/- sheep transplanted earlier. The AGFD and the dozens involved should be congratulated and commended for this most outstanding effort. Click here to read the AZ Game & Fish department press release. The first attempt to reintroduce desert bighorn sheep into historic range/habitat in the United States was at Aravaipa Canyon, at the extreme northern end of the Galiuro Mountains of Arizona. In 1955, a cooperative agreement between the state wildlife agencies of Arizona and Texas, also the U.S. Fish and Wildlife Service, the Wildlife Management Institute, and the Boone and Crockett Club, was signed. It provided for 50 desert bighorn sheep (O.c. mexicana) to be captured in Arizona, with 25 to go to the Black Gap WMA in Texas and 25 to the Aravaipa Canyon area.